When Destiny 2 director Luke Smith sends an email, his signature reads a little differently than you might expect. “Luke Smith, Scarab Lord”—an honorific given to just a few hundred WoW players out of the tens of millions who have played since it launched. It’s a title Smith came to own when his tauren Shaman, Aganathyre, stood before thousands of players on the Eredar server one fateful Saturday morning in spring 2006 and rang an ancient gong. In 2006, Blizzard launched a world event so ambitious that, to date, nothing has eclipsed it. With many of Azeroth’s original threats defeated, players’ attention turned to Silithus, a land on the doorstep of the dormant insectoid empire of Ahn’Qiraj. To open the gates and unleash the monsters (and loot) within, players had to contribute to a war effort that required cooperation on a scale never seen in World of Warcraft before or since. It wasn’t just words in a quest window—all of Azeroth came together to fight the Qiraji. As the raid leader of Paradox, Eredar server’s top Horde guild at the time, Smith didn’t realise what he was doing when he claimed Broodlord Lashlayer’s head. The guild had cleared the Blackwing Lair raid, where the Broodlord resided, plenty of times. But Lashlayer’s head was a new item they had never seen before. Because only one version of it dropped for the 40 players in the raid team, Smith took it for safekeeping. “I said hey this thing is going to drop from Broodlord, it’s the head, and I’m going to take it,” Smith says. “This was before people knew what it was for.” He didn’t know it would put him on the path to becoming a legend. Lashlayer’s head became the first piece in a quest chain to build The Scepter of the Shifting Sands, an artefact that would ring the Scarab Gong and open the Gates of Ahn’Qiraj for everyone on the server. But doing so was a gargantuan effort. To fuel the war effort, players in each faction had to gather just over a million different supplies from 90,000 copper bars to 250,000 Mageweave Bandages—each one handcrafted by an actual player. It was a 24-hour effort for Smith’s character. When he slept, friends would log into his account to play and receive carapaces from others. During the day, Smith organised raids to defeat the bosses required to earn the three shards to craft the sceptre. Amazingly, Smith and his guild beat the Alliance and became the first to complete The Scepter of the Shifting Sands, grind the requisite reputation and amass the millions of supplies. 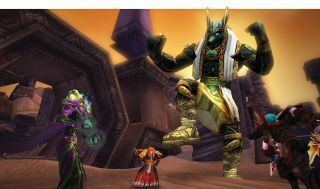 It was official: he would become Azeroth’s champion against the Qiraji threat and the Scarab Lord. The moment that gong was rung, and the game-wide broadcast made sure everyone knew Aganathyre’s name, the Gates of Ahn’Qiraj opened and hundreds of monsters spilled forth. It was a battle that would last ten hours, but Smith and Paradox weren’t there to see it. They waded through the hordes and began a new race: the first to clear the new raid.